French Londoners gathered en masse at Les Republicains conference last week. Still awaiting the conference’s featured speaker, hundreds - if not a thousand or so - of people chattered away in what would on the surface seem completely characteristic of an evening event. But beyond the roar of the crowd, beyond the elegant clothes and the luxurious setting, there was an ubiquitous sense of unease. Listen a little closer to any of the conversations and the topic of Brexit ruled the agenda. Indeed, French Londoners are having to reconsider their stay in the capital after a majority of British voters decided last week to take the country out of the European Union. Once former French President Nicolas Sarkozy had entered the room, received a standing ovation and made his way to the podium however, he sought to calm his audience’s concerns. First, he told them that, under a Republican government if his party were to claim victory in next year’s Presidential election, France would extend an olive branch to the UK to salvage what is left of their special relationship. Then he set out his vision for a “New Europe”, a reformed EU that would scale back the project of ever closer union to respond to the growing concerns of Europeans across the continent. A first glance at his mini manifesto might have sparked memories of the euroscepticism of the Brexit debate. Sarkozy was suggesting putting an end to the EU’s expansion and its bureaucratic leadership, radically reforming the Schengen area and devolving more sovereignty to national parliaments. But when the former President spoke of his project, he made clear that today’s European Union had reached a point of maximal integration, and that the bubble might burst soon if no reforms were undertaken. Mr Sarkozy’s argument makes sense: Britain’s exit from the EU might be only the first of many blows to the union’s integrity, as eurosceptic parties are on the rise in several other countries. If something isn’t done to meet the concerns that a potential “European superstate” provokes, then the Union risks crumbling altogether. 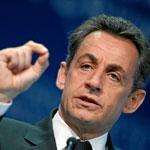 But Mr Sarkozy’s suggestions did not convince all. That was clear from the questions: some members of the audience asked whether greater European integration might be a better alternative and if radically reforming Schengen was the right course of action. The former President, in the same charismatic vein that marked his speech, argued that borders were necessary and reiterated the fact that a Republican government would seek to strip benefits from foreigners for the first five years of their stay in France. Another question suggested giving EU citizens the right to vote in French Presidential elections. Reminding us that EU citizens could already participate in local elections, Sarkozy shrugged off the notion that they should also choose France’s President. He added later that although he had always felt European, he was French before anything else. A quote quite emblematic of his speech. Other proposals were well received by the audience, notably shielding Europe from the activities of the International Monetary Fund, which has on multiple occasions provided Greece with bailout funds. He also suggested the creation of a European bailout fund although one might say that the European Financial Stability Facility already works to provide financial aid for heavily indebted eurozone members. Sarkozy also suggested that regulations and directives passed by the European Parliament should be ratified by national parliaments before becoming law in those countries; a proposal that was well-received and that could address European concerns of loss of sovereignty. 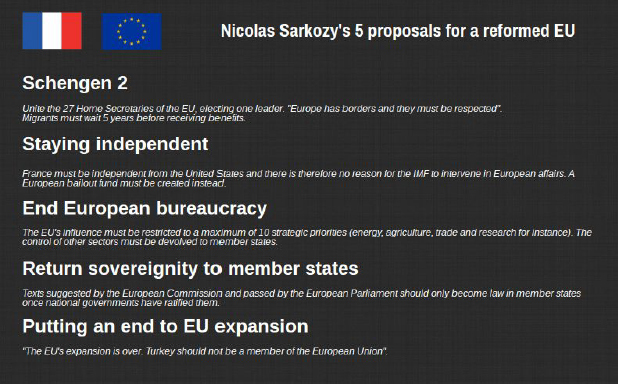 But when listening to Sarkozy talk, it was impossible not to wonder how many of these reforms could actually be enacted, as negotiations would have to take place supposedly between the 27 member states as well as the European Commission, the executive branch of the EU. The proposal to water down the EU’s influence in national affairs by limiting the union’s bureaucracy is a striking example, as Sarkozy would have to work alongside those very bureaucrats to achieve the reform. In his speech, the former French President stated that he would look to work with Germany to change the EU as it is, but the question remains whether Angela Merkel would adhere to Sarkozy’s vision of a new Europe. The German Chancellor recently said that she wants to see the restoration of the Schengen Area after countries have reinstated border protections in the midst of the refugee crisis. She might therefore disagree with the former French President’s “Schengen 2” proposal. But those questions lie in the years to come. On the evening, Mr Sarkozy will have been pleased to receive a standing ovation when he arrived and relieved to receive another when he left. Just as they had entered the room, the members of the audience headed for the exit chattering. Listen a little closer and many of the conversations still centered around Brexit and what the near future holds for the French of London.